Since a Valentine’s Dinner about 20 years ago, Alder Wood Roasted Salmon has been a Wolfdale’s signature dish. The first night we made a heart shape out of the Salmon. 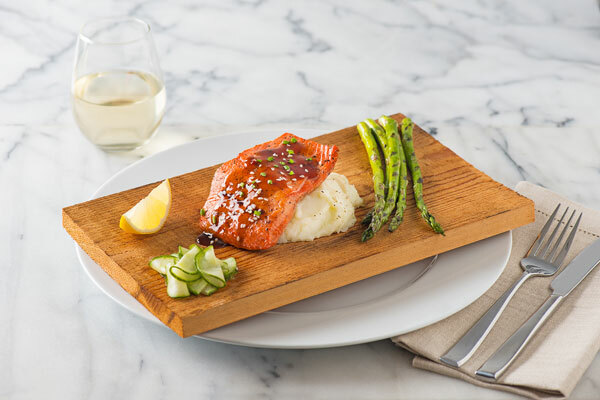 For dramatic presentation and for ease of service we keep the salmon on the wooden plank and serve the whole thing on top of a large dinner plate. The hot plank enhances all of the aromas and excites the guest. Take into account the heat retention on the wood planks because the salmon will continue to cook even after you remove the planks from the oven. We enjoy great local California King Salmon in the summertime. Vote for Your Favorite California King Salmon on the CA Grown People’s Choice Awards.